This headstone posted by Roxy has been bothering me since I saw it earlier. The men are not Frederick and George McAllum. That must be the mother's maiden name. There's certainly no-one with that name in the Morayshire Roll of Honour. Do we know which war memorial is nearest Birnie Churchyard, is it Elgin? Perhaps we could narrow it down that way? Look for two men with the same surname on that war memorial who's christian names begin with F and G.
Would the 1901 census help at all? I used Geoff's search engine for CWGC to see if there was anyone who had Louisa McAllum (also tried McCallum) but no luck so I guess she is not listed as a parent (at least under her maiden name). I reckon the way forward would be to find her marriage entry to find the married name. There is a War Memorial at Birnie; there are no casualties named Fred or George. Elgin is the nearest large town/city. I will check names from that WM. Additional information: Son of Thomas Robert and Louisa Dawe, of 30, South College St., Elgin. Grave/Memorial Reference: III. F. 51. No sign of George on CWGC but there is this on SNWM but there's an 's' on the end of the surname and this George was born in Ayr. The 1901 census shows Louisa living with her two sons in Hammersmith. The 'missing' son is Thomas G Dawe. PM me if you want the census page and I will email it, I think ancestry get a bit funny about their copywrite. Secondary Unit Text: posted to 2nd/9th Bn. I seem to have missed how we got from Louisa McAllum in Elgin to Louisa Dawe in Hammersmith. Can a clever person explain? Please. It's usually me who's lost so welcome to my wee club!! 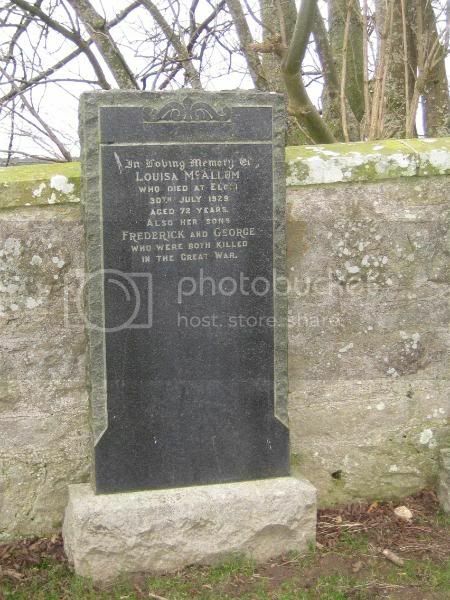 Paul must have access to the 1901 Cencus and when I found out her married name (by finding the death of a Louisa Unknown with an other name of McAllum in Morayshire on Scotland's People), he then searched for a Louisa Dawe of an appropriate age who had sons which matched the ones we knew about. I've checked the Morayshire RoH and neither man is listed so I'd be surprised if they are on any local war memorial. It looks like the Dawes moved to Elgin after the war. Did you notice both brothers were in the 1/15th London Regiment. Their numbers were 530011 and 530024 so they must have joined up together. Thomas George died in the 2/9th Bn LR though.